Major General Bandín was born in Puebla del Caramiñal (Corunna) on April 13th 1955. He joined the Naval Academy in 1975 and was promoted to First Lieutenant in 1980 (Quartermaster Corps). 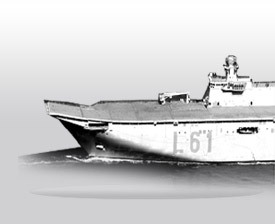 As First Lieutenant he served as Supply Officer in the patrol boats ‘Atrevida’ and ‘Villa de Bilbao’ (1980-1982) and the Landing Craft ‘Conde de Venadito’ 1982-83). In July 1983 he was promoted to Captain serving in the following posts: Supply Officer in the frigate ‘Extremadura’ (1983-85) and the Marine Corps Southern ‘Tercio’ (1985-88). He was also professor of Accountancy at the Naval Academy (1988-91). In March 1991 he was promoted to Major and posted to the Ferrol Arsenal as Chief of the Supply Service (1991-94). He also served in the following assignments: Secretary of the Ferrol Quartermaster’s Office and IRS Section (1994-96) and Paymaster of Ferrol (1996-2000). He attended the following courses: Training Course for Quartermaster Corps Majors (1993) and Supplies and Transport Course (1991-92). In July 2000 he was promoted to Lieutenant-Colonel and assigned to the Economic Section of Ferrol Quartermaster’s Office (2000-2004) first, and then to the Naval Academy (2004-06). In January 2006 he was promoted to Colonel and posted to the Undersecretary’s Office of the Economic Management and Contracts of the Financial Affairs’ Directorate as Paymaster Chief (2006-09). He also served in the Subsidiary Management Body of the Economic Affairs Directorate of the Spanish Navy (2009-11) and was Chief Quartermaster of Ferrol (2001-12). In June 2012 he was promoted to Brigadier General (Quartermaster Corps) and appointed Director of the Supplies and Transport Department. In August 2014 he is promoted to Major General and appointed Director of Economic Affairs of the Spanish Navy. He took up office on September 9th. Major General Bandín Mosteyrín is married to Teresa Domínguez and has two children.